Despite happening over a hundred years ago, the six killings over the autumn of 1888 that were attributed to Jack the Ripper continue to hold a powerful grasp over our collective imaginations. While not the first serial killer in history, he was the first to have his crimes sensationalised by the media of the day, and the first to be given a nickname. Hundreds of books, articles and films have been produced speculating as to the identity and motive of the killer, and are still being produced – the study of this particular series of crimes has even spawned its own name: “ripperology”. I am far from being a ripperologist, but do have an interest in true crime and have read a number of books about Jack in the past. 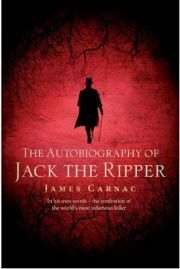 The Autobiography of Jack the Ripper is something quite different from other things I have read, however.